Judge stays drug charges after Crown breaks deal - Patrick C. Fagan, Q.C. A judge Monday stayed charges of trafficking in cocaine and marijuana against a Calgary man because the Crown reneged on an agreement to do so two years ago. 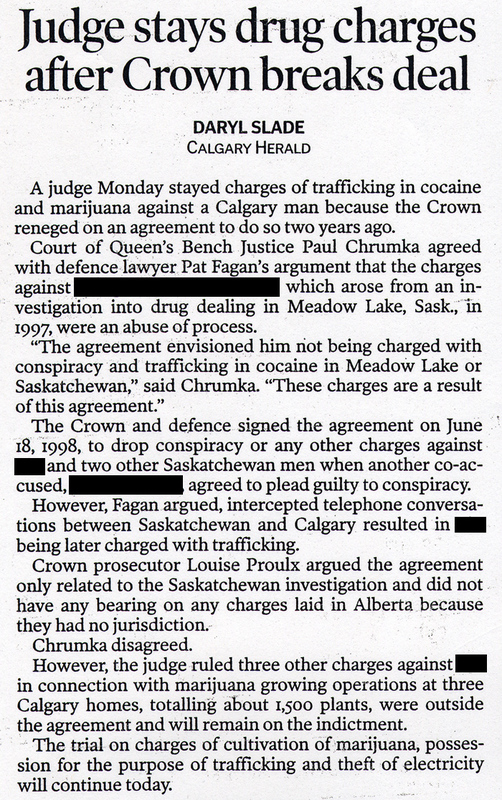 Court of Queen’s Bench Justice Paul Chrumka agreed with defence lawyer Pat Fagan’s argument that the charges against the accused, which arose from an investigation into drug dealing in Meadow Lake, Sask., in 1997, were an abuse of process. The Crown and defence signed the agreement on June 18, 1998, to drop conspiracy or any other charges against the accused and two other Saskatchewan men when another co-accused agreed to plead guilty to conspiracy. However, Fagan argued, intercepted telephone conversations between Saskatchewan and Calgary resulted in the accused being later charged with trafficking. Crown prosecutor Louise Proulx argued the agreement only related to the Saskatchewan investigation and did not have any bearing on any charges laid in Alberta because they had no jurisdiction. However, the judge ruled three other charges against the accused in connection with marijuana growing operations at three Calgary homes, totalling about 1,500 plants, were outside the agreement and will remain on the indictment. The trial on charges of cultivation of marijuana, possession for the purpose of trafficking and theft of electricity will continue today.